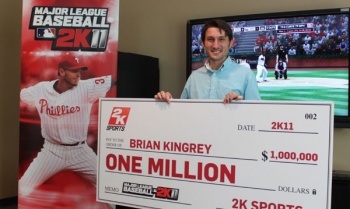 27 up and 27 down earned Brian Kingrey $1 million while playing MLB 2K11, winning 2K Sport's now annual contest. Pitching a perfect game in baseball is an extremely rare feat. In the entire history of the sport, spanning some 400,000 games played since the National League formed in 1876, a game in which all 27 batters a pitcher faces is retired with no hits walks or errors has only occurred 20 times. Sure, there's been a rash of perfect games in baseball recently, with two thrown last season and eight in the last decade, but that doesn't diminish such an accomplishment. And while pitching a perfect game in a simulation like MLB 2K11 is by no means as difficult as the real thing, that doesn't mean Brian Kingrey's feat didn't take real skill, perseverance and dedication to pull off. 2K Sports awarded the 25-year-old music teacher a check for $1 million after he practiced five hours a day for two weeks leading up to the challenge. "I'm really into competitive games," Kingrey said. After he found out about the contest he devoted his life to throwing a perfect game in MLB 2K11. "As soon as we saw it, my wife said to me, 'You have to do this.'" The strategy Kingrey employed in picking the ideal matchup to pitch his pefect game would even make major league baseball managers proud. He chose to pitch 2010 NL Cy Young award winner Roy Halladay against the Houston Astros. "Halladay has this really mean slider that's incredible versus right-handed batters," Kingrey explained. "I picked the Astros because they're really aggressive when they attack the ball, so they swing at a lot of pitches they probably shouldn't swing at, and the Astros have only two left-handed batters." Kingrey is recently married and he and his new wife are definitely struggling financially so the money couldn't have come at a better time. "Our first purchase is going to be a refrigerator. Me and my wife just got married. We just got into our new house, and we can't afford a refrigerator just yet, so we've been using a little dorm fridge." Someone should send Kingrey a six-pack and some stadium peanuts.